Family holiday home with pool, spa pool, pizza oven & trampoline! A fantastic family home with huge outdoor entertaining area, large flat lawn, pizza oven, large swimming pool and spa pool. Being north facing, the property gets all day sun and magnificent sunsets. This idyllic property has plenty of space for extended family and friends to relax and unwind. The open plan kitchen and large dining and living areas have bi-fold doors opening onto the large deck and pool areas, then the huge flat lawn. The pizza oven provides a great option for a relaxed meal. The house is equipped with Sky TV, Apple TV and a sonos sound system inside and out. Upstairs is the master bedroom, with a deck overlooking the gulf. It has an ensuite and a walk in wardrobe. Downstairs are a further 3 bedrooms, as well as the family bathroom. If you can drag yourself away from this fantastic playground, Vista on Hauraki is perfectly located for exploring the island. Within a few minutes drive there are at least 5 great beaches, the cafes and shops in Oneroa Village, the market and shops at Ostend, and multiple great wineries! What more do you want? Please note that prices are for the main house (sleeping 8) only. The cottage (sleeping 4) is available for an additional cost - please ask us. Each stay incurs a $220 charge for quality linen, towels and exit clean so you have nothing to do but relax, refresh and enjoy. No parties or gathering. Family groups only. 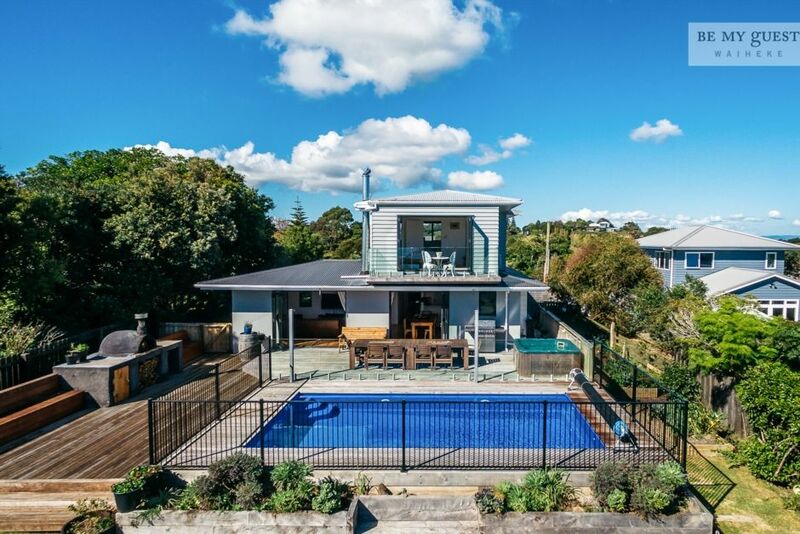 The perfect base for a relaxed family holiday on Waiheke Island. A fantastic family home with huge outdoor entertaining area, large flat lawn, pizza oven, large swimming pool and spa pool. Being north facing, the property gets all day sun and magnificent sunsets. And it has lovely views! The main house is great. The main house is great. The location is great. The sleepout is fine however at the price we paid would have been nice to have had a fan of some sort (or A/C). It gets very hot up there with no cross breeze. Also the springs on the main bed are very noisy. Ideally located a few minutes drive from Oneroa Village, it is has 5 great beaches within a few minutes drive. Just round the corner is the Mackenzie Reserve, a 10 acre reserve with lovely walks and birdlife. Within 10 minutes drive is Onetangi Beach, a golf club, great wineries and award winning restaurants.